Welcome to our monthly review of the latest events of the last four weeks. With the tax season being so rough and fresh on our minds, we start with a much-needed tax related Financial Planning Tip. This months Financial Planning was once again straight from the field and this time from a relative. Those using Schedule A, receive the benefit of deducting a pre-set amount of sales taxes based on your income, zip, and number of exemptions OR using your actual sales tax that you have paid over the year. If you didn’t save all your receipts, you can still choose to claim state and local sales taxes. You could fill out the worksheet and use the optional general sales tax tables in the Instructions for Schedule A (Form 1040) , but why not take the easy route and use the Sales Tax Deduction Calculator! Capital Markets, Gold, or Rates ? Recently I challenged a group as to what they thought were the most important item currently, choosing from the Dow, Gold or interest rates. Hands down, interest rates. 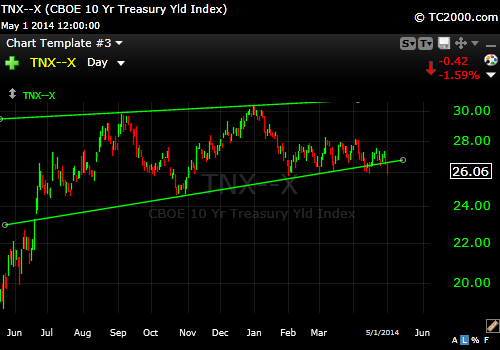 This is the 10 year treasury rate, seen hovering over the voodoo chart line. We are watching this closely as we just do not know why it is persistently staying so low. Late in April the FOMC lowered their bond purchases by another $10 billion monthly. Recall these purchases were to keep rates down. Doh… Seems as if rates do not know they should be rising. This entry was posted in Interest Rates, Investing/Financial Planning, Tax Related, Video and tagged 10 Year Treasury, Financial Planning, sales tax, Sales Tax Deduction, sales taxes, Tax Deduction Calculator, Tax Tip, Video. Bookmark the permalink.